What happens to tires when they are no longer suitable for their original use? Vehicle tires are among the largest and most problematic sources of waste simply because of their size, the volume at which they are produced (approx 1 tire/person/year is discarded), their desirable durability and frequently their improper disposal. Our family signed up in 1989 for Missouri’s Stream Team program in it’s first year of development. 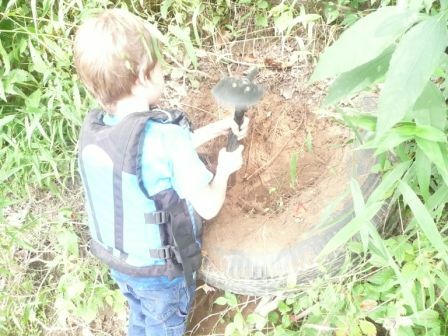 Along the creek that runs perennially past our location, tires are not a big problem in our watershed but we have found them dumped down a steep hillside, just off the county dirt road. Twenty years later, we were mentoring the development of a new Missouri Stream Team for the Castor River in Madison County, Missouri; and had our first clean-up effort on Sat, Aug 1, 2009 with only 6 volunteers, half of which were from our own family. Even so, we were able to recycle over 92% of the items taken out of the river; a little over 900 lbs recycled, out of the almost 1,000 lbs of trash we collected in just one day, from just 3 miles of riverway. This included 321 lbs of rubber in the form of 11 car & truck tires. People often dump tires into streams and rivers as well as alongside roads without a lot of traffic because there is a fee attached (though in Missouri in 2009 that was only $3/each) to their legal disposal; and for some people, it is just too much of a bother to do it properly. In our region, in the past, there were large “dumps”, mountains of old tires, that frequently caught fire. Thankfully, the state has closed these and forced their clean-up. Due to heavy metals and other pollutants in tires there is a potential risk for the (leaching) of toxins into the groundwater when placed in wet soils. This impact on the environment varies according to the pH level and conditions of local water and soil. Research has shown that very little leaching occurs when shredded tires are used as light fill material; however, limitations have been put on use of this material; and each site should be individually assessed to determine if this product is appropriate for given conditions. Ecotoxicity may be a bigger problem than at first realized by the tire industry. Studies show that zinc, heavy metals, a host of vulcanization and rubber chemicals leach into water from tires. Shredded tire pieces leach much more, creating a bigger concern, due to the increased surface area on the shredded pieces. Many organisms are sensitive, and without dilution, contaminated tire water has been shown to kill some organisms. Testing for water quality is one of the practices of Missouri Stream Teams. Happily, tires are also one of the most re-used waste materials owing to the natural resiliency of the rubber itself. 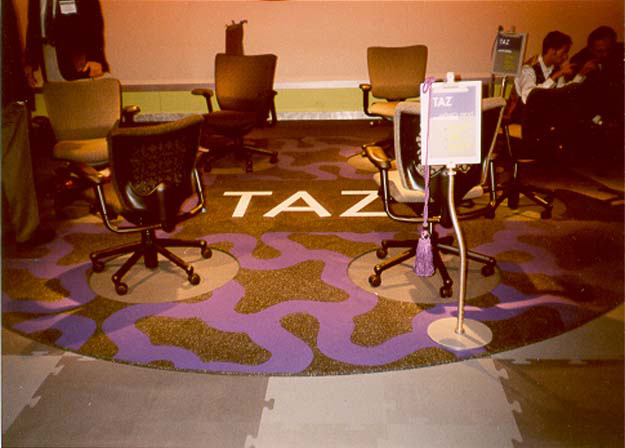 Ground up tires are known as crumb rubber in the recycling market. Shredded tires are still being used in some landfills to replace other construction materials, for a lightweight backfill in gas venting systems, leachate collection systems, and operational liners. Shredded tire material may also be used to cap, close, or daily cover landfill sites. Scrap tires as a backfill and cover material are also more cost-effective, since tires can be shredded on-site instead of hauling in other fill materials. Recent developments in de-vulcanization enable dealing with substantial volumes, taking 40 mesh whole tire crumb and converting it into value-added compounds without degrading the polymer and without generating any pollution. This new generation in de-vulcanization technologies operates with very high productivity while maintaining a low energy footprint. The compounds produced from processed tire scrap can be blended with virgin rubber compounds, maintaining performance while substantially reducing the raw material cost. The substantial economies of scale and value added benefits make burning tires for disposal entirely unnecessary. 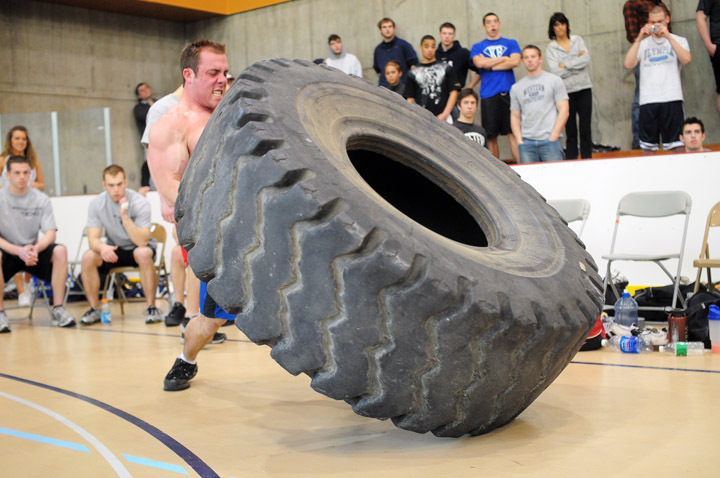 Agricultural use of rubber for tires results in very large tires. In Costa Rica, one company is developing processes to de-vulcanize the scrap from producing rubber gaskets (as always, industrial waste is a larger volume problem than post-consumer waste, even though post-consumer behaviors are important because there are so many people now on the planet). They have determined that 10% of that de-vulcanized styrene-butadiene and natural rubber can be used in agricultural tire tread, saving 7% of the traditional cost of manufacturing a conventional ag tire. 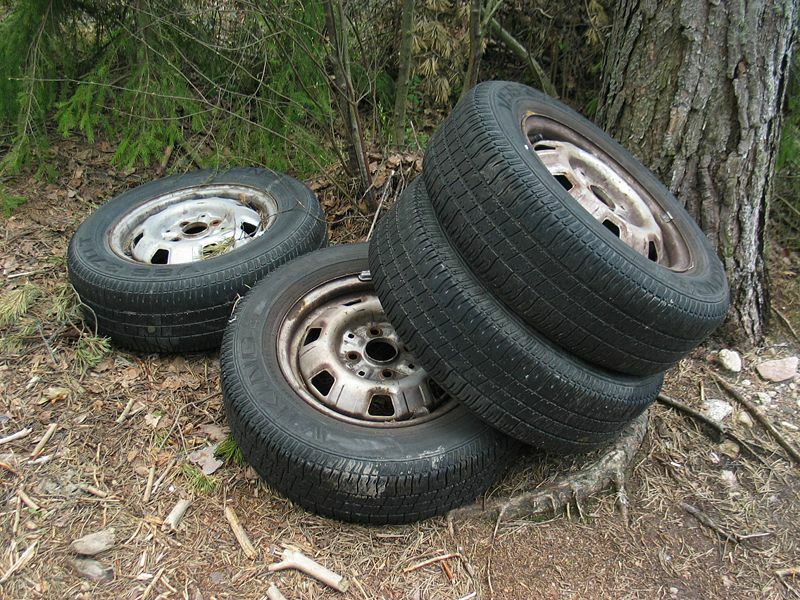 Tires can be recycled into road surfaces. At Clemson University, Asphalt Rubber Technology Service (ARTS) promotes the practical utilization of waste tire rubber within asphalt and civil engineering applications. Thirty percent of all the asphalt used in California must contain rubber by law. 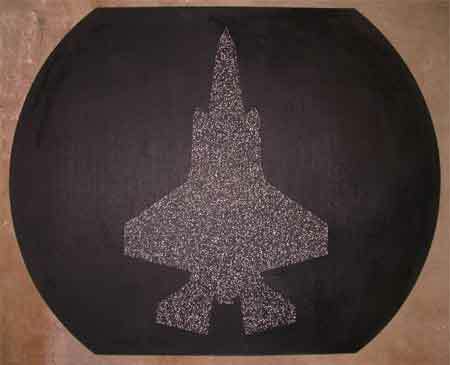 Arizona, Texas and Florida also use rubberized asphalt extensively, while Washington, Colorado and Georgia are evaluating the material. ARTS also sponsors the Tire Recycling Education and Development Service (TREADS) program, which provides grants for education and technology transfer. Tires have also been cut up and used in garden beds as bark mulch to hold in the water and to prevent weeds from growing. There are some “green” buildings, both private and public that are made from old tires. Our family has personally visited the Earthship headquarters near Taos, NM (http://earthship.com/) This is a heartening development for the usage of old tires, just as they are. Their website statement declares – “. 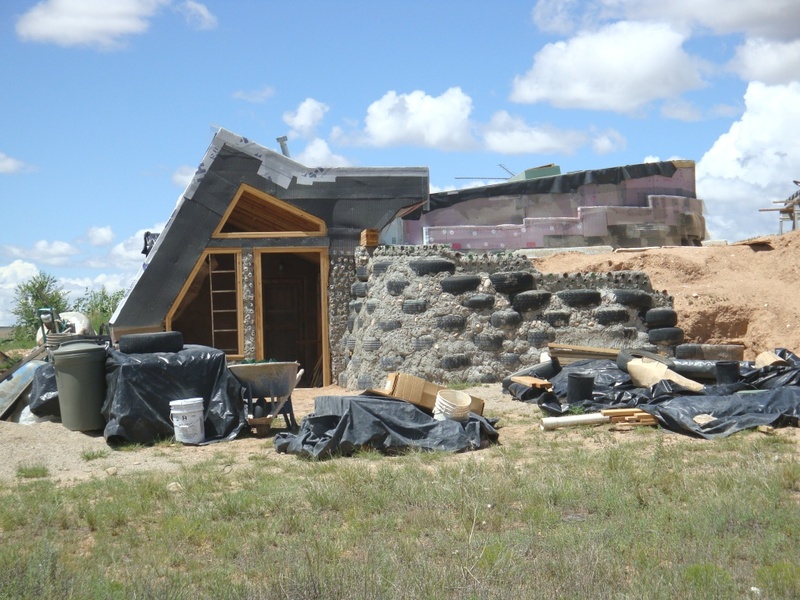 . . the Earthship is the epitome of sustainable design and construction.” – and having seen this for ourselves, we would tend to agree. Paso Robles, CA known for wineries and hot springs, is also known for specialized industry and a high utilization of sustainable building structures including rubber-insulated concrete and straw bale constructions; as well as hosting several wind farms in the pass, which generate electric power with wind generators. reRubber (www.rerubber.com/‎ – “committed towards the best green practices in the crumb rubber industry”) uses an ambient grinding technique to make crumb rubber from 100-percent California scrap truck tires. They say that they are “getting it fine enough where it bonds in different matrices with other chemicals.” Their product diversity includes tire sealants and coatings for automotive, as well as infrastructure and green building applications. Our business contributes in it’s own small way as a solution to the constant creation of tire waste. 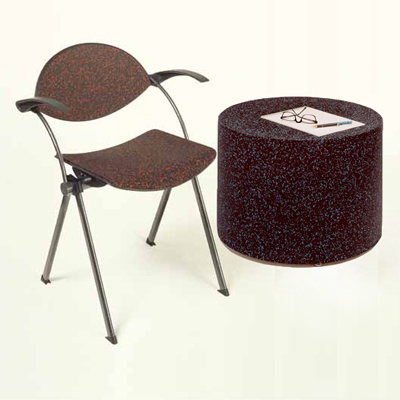 Our Tire Veneer material uses 80-100% post-consumer crumb rubber molded into blocks and logs. This material is frequently used for flooring but has applications in furniture and even for weed control (as tested in our own small organic family garden and as a boundary against an ever invasive, jungle like environment around various areas on our farm including as a protective barrier in a rainfall replenished pond for frog and toad breeding activities – yes, the tadpoles and frogs do not seem bothered by it). We also have utilized railroad ties made from 100% rubber for over a decade to contain sand in the children’s large play area. Just this Oct 2013, at the Omega Institute, they had a conference titled “Where We Go From Here”, a weekend conference (Oct 5, 2013-Oct 7, 2013), that included Paul Hawken and former Pres Bill Clinton. Attendees explored opportunities and solutions for our interdependent world, seeking a unique whole-systems perspective to recognize the reality that all things are interdependent. The global challenges facing us today are complex; and the waste from our vehicle tires is only one small part of that picture but happily one with a high degree of success. A report from 2003, cited by the EPA, said that the market (for “both recycling and beneficial use”) existed for 80.4% of scrap tires, which in 2003 was about 233 million tires per year, at 22.5 lbs per tire. That’s a lot of waste diverted. 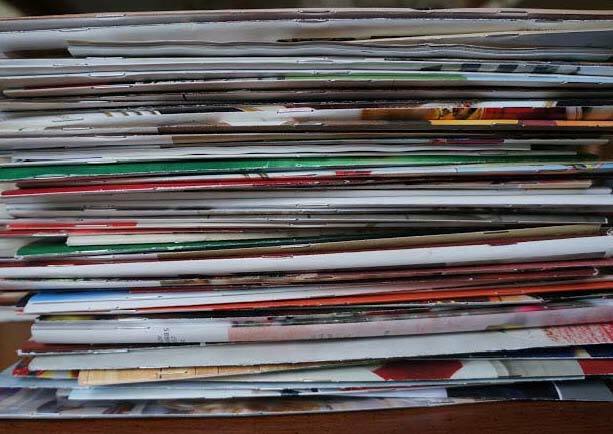 We are already entering that time of year, when our waste paper recycling bin overflows quickly. I don’t really have any solutions, beyond recycling them. I do find them useful for “browsing”. A bit like walking the mall looking for the perfect impulse item to gift a loved one at Christmas. These days, to do that would be a luxury or an inefficient use of my time – take your pick. I do most of my buying online. The internet has changed all of our lives in numerous ways. I don’t buy cookbooks anymore – preferring to google in my “ingredients” and choose from what pops up, give it a try and if it’s really good, I’ll keep the print-out and if not, I recycle it with the paper. Like the blog author though, I do enjoy browsing through some and some are absolutely crucial to making “Christmas Special” for a couple of boys growing up in this household. 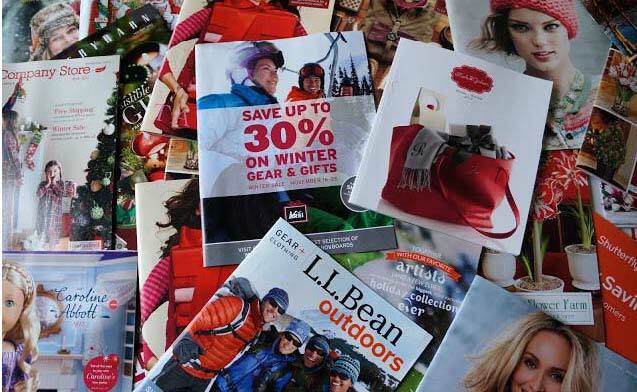 Still, I sincerely resent getting the same company’s catalog – weekly – for 3-10 weeks before Christmas. One of her readers also recommends a phone app – PaperKarma – and says “Once you register for free, you simply take a picture of the sender’s address label and upload it. 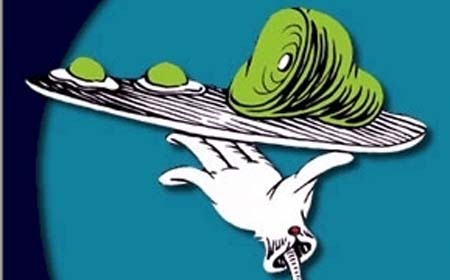 After some ‘digital magic’ the system will confirm the sender with you and then contact the company to remove you from their mailing list.” My husband and I once got on a “stop junkmail” binge and would use “paid, return” envelopes to return everything we received to the sender with a note to remove us from their list. It was VERY effective. All of these options are also time consuming; and for many of us, time is an extremely valuable commodity that is more precious than money or aggravation. We have an old string of Christmas lights that we continue to light up on our backporch throughout the year because they give a wonderfully bright but subdued light to the whole area. We are going to have to retire them because it has become impossible to find the old style bulbs we used to replace as they burned out. Disposable and consumable are what the USAs economy is built upon. 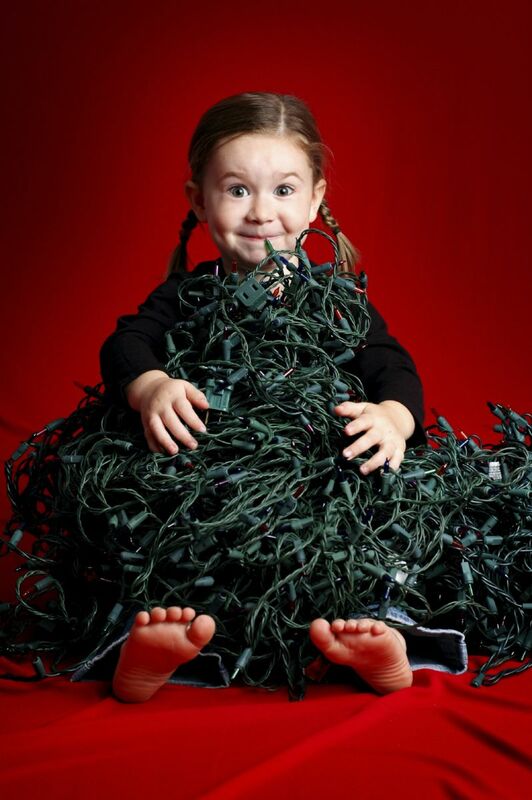 Thankfully, some are now providing recycling services for old strings of Christmas lights. http://www.HolidayLEDs.com offers a recycling program with the incentive of “a coupon good for 25% off LED Christmas lights”, which doesn’t help to end consumption but is better than sending them off to the landfill. Nearby in St Louis, MO (and the source of the image above) – there is the “Holiday Light Recycling Drive” at StLouisGreen.com (http://stlouisgreen.com/Holiday-Light-Recycling-Drive) which runs from Nov 16th through Jan 12th. Last year they diverted 107,000 pounds of holiday light from local landfills. These are all issues that individual consumers face each holiday season but since we are also reaching out to the business community, I would like to end this blog with a few thoughts (and no solutions) about “business” clutter – in the Architectural and Design Community this has been partly composed of sales catalogs and physical samples. When I first came into this business, we sent out metal 3-ring, vinyl-clad binders with professionally printed hard glossy paper stock. They were the typical expectation of A&D Libraries. At some point along the way, as a supplier at the business-to-business level, we decided to keep our costs to the purchaser down by eliminating a lot of the “frills”. We moved to a highly recyclable brown cardboard binder with easily removable rings filled with plain white-paper catalog contents. Now, in the redesign of our website, we are wondering how useful it is to send out catalogs anymore. We have kept our website lean and professional, simply a “tool” of the trade that loads quickly. 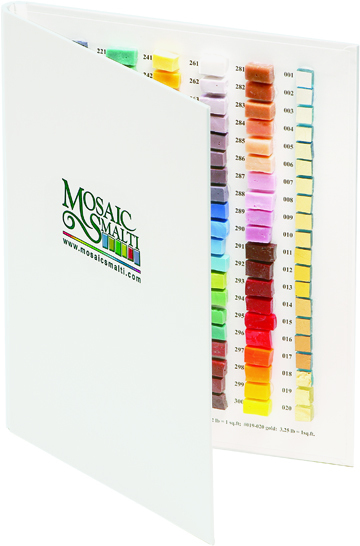 Our material sample sets cost, a seat of the pants estimate of, approx. $50 to produce (image source above is http://www.corp-image.com/). That doesn’t sound like much but multiply it by the 10,000+ contacts in our business database, and that adds up not only to a significant financial investment but also a huge quantity of “solid waste”. It breaks my heart to know that our material samples might get thrown into a dumpster, on occasion; but I know it must happen. We utilize regional outlets such as Re-Use in St Charles MO or the Teacher’s Recycle Center in St Louis MO to find a second life for reject or obsolete material samples. It’s a bit more work but well worth the effort, to have a clear conscience about how we dispose of waste. In the early days of our marriage, we once took obsolete laminate samples and tiled some 1/2″ thk, 9-ply Baltic birch plywood lacquered slabs, making trivets for our family members as Christmas presents. We couldn’t afford to do more; but the amazing thing is that a quarter of a century later, most of our family members still have, use and treasure those simple gifts. We used to send out complete sample sets with a catalog in a strong but nicely re-usable or recyclable box to every design professional’s firm that contacted us but we are re-thinking that because excess is waste and in a world with a growing population, it is better to send out specific 2″x4″ or 6″x6″ or even larger “presentation” samples in the actual desirable colors than “waste” samples on the risk they will be someday thought “obsolete” and tossed into a dumpster, thereby adding to the “clutter” of solid waste at the landfill. Each of us may not be able to make a significant dent in that overall “clutter” of solid waste but every effort actually does matter, to the wholeness of the outcome. When cash flows are abundant it is so very easy to “waste” financial resources in “irrational exuberance” as Alan Greenspan once famously declared before the economic collapse of late 2008. 25 years ago, we learned to understand that marketing is a black hole that can never be accurately quantified – cost vs effectiveness. Small business loans and grants won’t fund such flimsy and nebulous expenditures, preferring hard assets. When our business was going great guns overwhelming before the collapse, we could easily have overextended ourselves. It was with a sense of sadness that I discovered last week, one of our contacts – Karlsberger Architecture of Columbus OH – had collapsed in 2011. They were an 83 yr old firm, doing $22.6 million in 2009 revenues. All it took to bring them down was the loss of one major contract. Sobering. We have to be mindful about how we utilize our personal assets, our business assets, our national assets and our global assets. If we have learned nothing else during the last few years, it should be at least that much. Greenpeace traces the term to – “around 1990 when some of America’s worst polluters (including DuPont, Chevron, Bechtel, the American Nuclear Society, and the Society of Plastics Industry) tried to pass themselves off as eco-friendly at a trade fair taking place in Washington, DC.” It is interesting to note, that if that was the “same” EPA trade fair our company was invited to, and did attend, we didn’t have a clue of any ulterior purposes behind that. The companies we came in contact with were small like us and by bootstrap efforts, trying to do a good thing for the environment by way of pursuing their business interests. Maybe we were put into different rooms ?, or perhaps we were just that “new” at it ourselves. UL Environmental is a division of Underwriters Laboratories that is offering “independent green claims validation”. They made quite a splash at Neocon in 2010 by giving out the bars of soap in the photo above. •The packaging does not list products ingredients, place of manufacturer, or whether sustainable paper and printing were used — important information that can help a consumer assess the environmental impact of the product. Michael Chusid, in that BuildingProductMarketing.com article, did note that – “On the positive side, the soap is one piece of trade show swag that I will probably use, unlike the plastic gizmos that will sit on my desk for a week and then wind up in a recycling bin or trash can.” Anyone who has ever walked a trade show “understands”. But seriously . . . knowing “who” to trust is VERY important. Since finding our “business calling”, we have been seeking to walk the walk, that our talk indicates (not only as a business, but in our personal lives as well, respecting the movement deeply). Admittedly, it is a process; and we are constantly learning new or better ways in which to live and regarding how we produce our product, that may be only a tiny step “better”, than the alternatives. We don’t claim to be the end all and be all for “saving the Earth”. I don’t think every company with any acknowledged environmental “edge” is trying to cheat the system or deceive their customers, many are doing the best that they can, to be a good “alternative” choice. But with some companies and regarding some claims, the activity is not so innocent nor benign. Unfortunately, while “green” certifications may be useful in determining the truth of some claims, the cynic in me also wonders if they can’t also be “bought”. I would certainly hope not. Our firm has enough skepticism about the plethora of firms claiming to offer “certification at a price”, that we don’t want good money chasing after a bad practice. 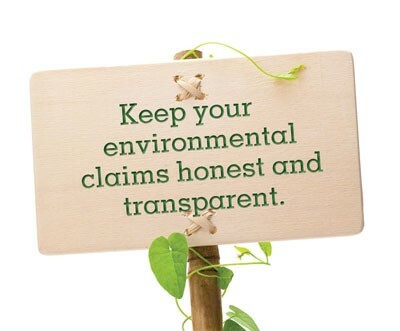 As the efforts to be more environmental improve within the business world, maybe certain confirmations will become truly “trusted” over time and be worth exploring. For the time being, we stand simply on our integrity, born of a long history as genuinely, environmentally-concerned citizens and business owners. An aspect of “green washing” that we run into with our competitors comes down to the difference between “post-industrial” and “post-consumer”, and why it matters at all. The truth is – industry produces a larger volume of waste than any individual – so, on an “entity” basis, it is admittedly, a “bigger” problem. However, the federal government, LEED requirements and die-hard environmentalists often focus, as does our own business due to our own environmental hearts, on post-consumer because in that realm, we are talking about changing a whole lotta behaviors, in a large mass of people. The challenge is greater; and individuals lack the economic and financial motivations that often move industry in a more “environmentally friendly” direction. It is important to find out – “Does the manufacturer truly know the actual source of their feedstocks ?” If the source of a manufacturer’s “recycled content” comes from a broker, it’s anyone’s guess. We used to be the only company offering “recycled content” restroom partitions, that just happened to be 100% post-consumer sourced in their origin. Now, we find we have “competition”. In our own investigations, we doubt that the claims accomplish what the intention in using “recycled content” is meant to achieve. We work closely with a company whose entire business focus is taking post-consumer HDPE bottles and sorting, washing, grinding or otherwise processing them into a useful form. In our earliest days, we used to do this baseline processing directly our selves; but eventually, we lacked adequate equipment resources to meet the rapidly growing demand to produce more volume. At that point, we came in contact with respected experts, in that field. 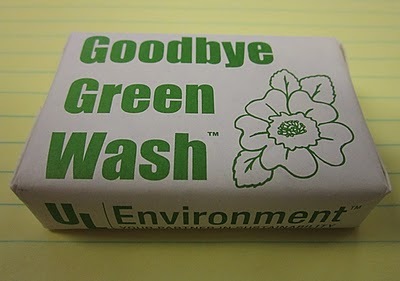 The issue of “greenwashing” is much larger than my blog space can explore at one sitting; but we have experienced some competition that seeks to deceive our potential customers that their “recycled content” has equal value to our own. So far, as we investigate such claims, we don’t see any truth in that possibility. Dealing with post-consumer feedstock is a complex matter that most companies really don’t want to get involved in. We have a quarter century of experience at making sure our post-consumer content has enough quality, to simply stand on it’s own useful merits as a material choice – before we even begin to point out, that it also is a more environmentally-sound choice for its utilization of existing waste. We follow the plastics industry news closely. 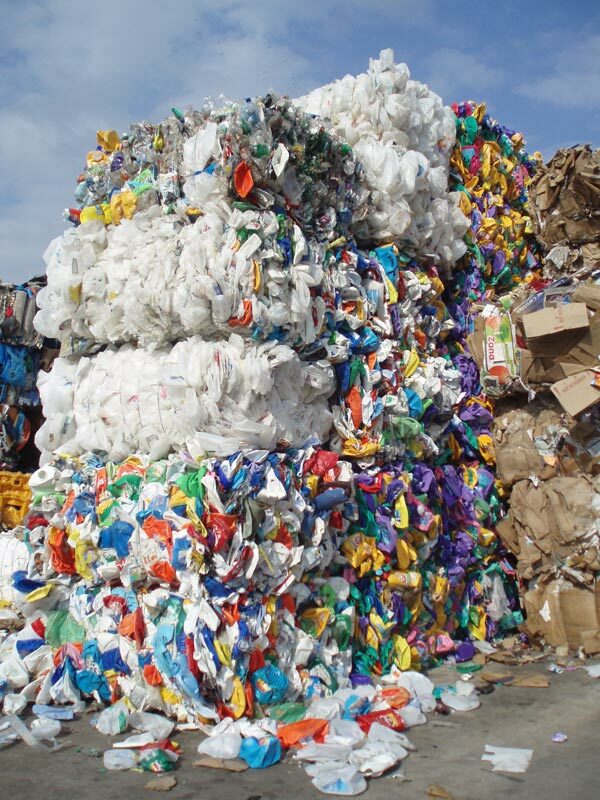 Our first recycled materials came from plastics feedstocks. We did not cause it to exist, so in an interesting way, we are not closely aligned with the plastics industry but it is because of them, that we can perform the service that is the foundation of our business. Plastics are not the only material we produce – there is also rubber and most recently cork (and the fact that it is a naturally growing tree, has been one of it’s deepest appeals to us personally). The first plastics were derived from organic cellulose materials in the mid 1800s and made possible the first flexible photographic film used for still photography and motion pictures. Formaldehyde and milk protein combinations were explored next. Humanity has had a long love-hate relationship with plastics. 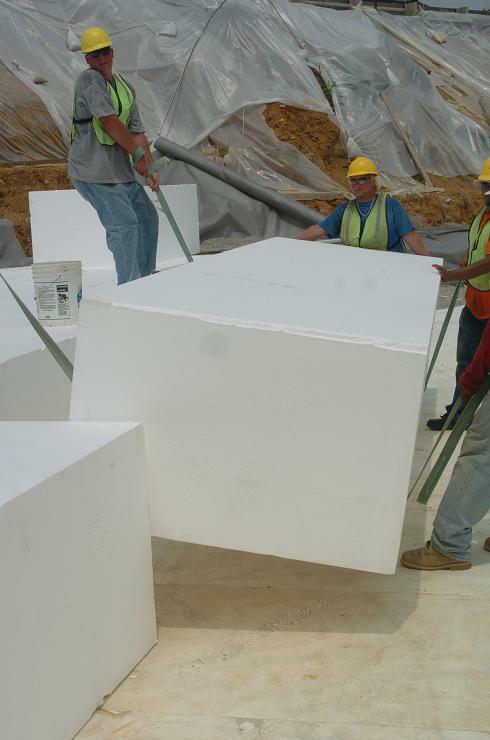 Polystyrene was first discovered in 1839. Generally, I have considered it a “problem” because it wasn’t easy to recycle it. However, large scale polystyrene recycling has been occurring in my own community in recent times. Only the very white and non-printed kinds can be recycled here but that includes those big bulky pieces often arriving with new computers for their protection in shipping. VersaTech of Fredericktown, MO supplied over 3,300 blocks at 38” x 50.75” x 192” each for just the first phase of a project to fill the Tucker Tunnel in St Louis MO. The tunnel was constructed in 1931 by the Illinois Terminal Railroad to alleviate traffic congestion and facilitate the transportation of goods and materials. The walls of the tunnel had become so unstable that they threatened a collapse of the roadway and tall buildings above it. The tunnel had also become a base for some of St Louis’ homeless population. VersaTech’s blocks are filling and stabilizing the tunnel and as a result, the spaces above it. 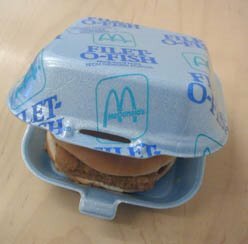 In the late 1980s, led by the efforts of the Environmental Defense Fund, McDonald’s phased out the use of it’s clamshells, which were the packaging for it’s sandwich products. Under public pressures, McDonald’s switched from the polystyrene clamshells to paper-based wraps for its sandwich packaging, providing a 70-90% reduction in sandwich packaging volume, reducing landfill space consumed, energy used and pollutant releases over the lifecycle of the package. However, making environmentally sound choices is neither simple, clear-cut nor certain. There are always trade-offs – the cloth vs disposable diaper dispute, or the paper vs plastic grocery bag choice. When paper is involved, we’re talking trees, or in the best case recycled paper, but the FDA does not allow recycled content to touch food products directly. Still, innovative methods of embedding recycled content, and enveloping these in virgin materials, are evolving in response, as a solution. 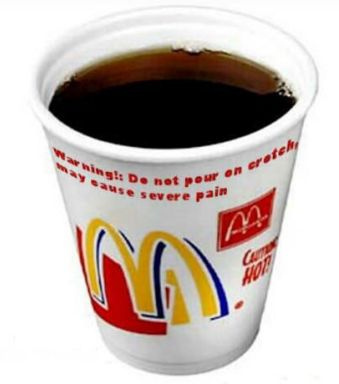 Now, thanks to efforts by the “As You Sow” organization started in 2011, McDonald’s will switch the hot beverage cups in all of their restaurants to double-walled fiber alternatives. With more than 14,000 locations in the United States alone, its impact is likely to extend globally to all major McDonald’s markets. Yet, the choice is a sobering reflection that 58 billion paper cups are thrown away every year. This equates to 20 million trees being cut down and 12 billion gallons of precious water used in processing. Styrofoam cups degrade at a glacial pace. Even 500 years from now, the foam coffee cup you used this morning will still be sitting in a landfill. And polystyrene has become a large problem for marine environments. The material breaks down into small pellets that are mistaken for food by some marine life, such as birds and fish, often causing death. So, for environmentalists wondering about a better yet choice, try relying on a reusable, washable mug every day for a whole year. Still, waste and such obvious issues are not the only problem with polystyrene. The EPA released a draft rule looking for safer alternatives to the flame-retardant chemical HBCD (hexabromocyclododecane) used in polystyrene production for building insulation. The EPA is exploring a more proactive response than simply listing chemicals under the Toxic Substances Control Act, indicating that they may pose a concern. Recently, with news of some dispute between the US Green Building Council’s proposed LEED modifications (that would have offered credits for avoiding PVC) and the plastics industry as a whole (especially the significant players in PVC pipe and Vinyl Window interests), the EPA is also taking a look at a standard, even if justified by business competition concerns, obstructionist argument of limiting the release of what is termed as “confidential business information”. Environmentalists have a good reason to be concerned that CBI claims could hide chemicals that might cause deep concerns. The EPA is tightening policies for CBI claims and declassifying unwarranted confidentiality claims, challenging companies to review their existing CBI claims to ensure that they are still valid and providing easier and enhanced access to a wider array of information. These decisions on the part of the EPA are friendly to the intentions of the USGBCs requests for more transparency regarding the content of certain building materials, when considered for LEED points. It is not surprising that the EPA has felt intense opposition and lobbying efforts from the chemical and plastics industries, as has the USGBC. A report on the concerns regarding HBCD in polystyrene insulation production has found 2 viable flame-retardant alternatives to HBCD for use in expanded and extruded PS foam insulation, applicable with currently used manufacturing processes. The EPA has been motivated by indications of persistent, bioaccumulative and toxic characteristics associated with the chemical, HBCD. One alternative, a butadiene styrene brominated copolymer is already in commercial production in the US. Even though its long-term behavior in the environment isn’t entirely known, its characteristics indicate a strong reason to view it as having a low impact on any health or environmental concerns. Specifiers generally seek to avoid a known potential for undesirable consequences with the decisions that they make for the built environment. Our company has struggled with our own concerns regarding one of the recycled plastics products that we offer known as Flexisurf. We pulled it entirely off the market, shortly after producing a large batch of samples for our market, because of our growing concern about this plastic in general, but mostly due to the impacts of its initial production. We have returned it to our product offerings because it is a positive response to the currently unavoidable presence of PVC materials in the form of high-volume production waste (from roofing membranes and automotive upholstery scraps), since we did not the cause the actual manufacture of the PVC material. Flexisurf creates a very durable and easy to maintain flooring and surfacing material, while keeping PVC out of landfills and away from the potential of entering groundwater. Sometimes, even the most environmentally aware, make difficult choices with no clear-cut “best” alternative. We seek to do the best that we know how, with the knowledge that we have, at the present time – and we never stop learning as much as we can. We are learning all the time and have no expectation of that necessity ending because the issues are always complex.